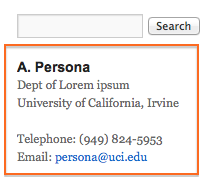 Sample contact information is listed in the sidebar of your website. Follow the steps below to edit this section with your contact information. Select Widgets from the Appearance toolbar in the Admin area. Click the triangle next to Text: Your Name in the Primary Widget Area to expand the widget. Replace the existing content with your own. Click Close to close this edit box. View your website to see the changes. Hint: You can always view the public view of your website by clicking on the Site Name in the top of the Admin screen.